« What happens to HDL level following Intensive statin therapy ? An unpleasnt debate with a cardiac surgeon : How to manage severe mitral stenosis with Mild to moderate Aortic regurgitation ? A 32 year old unmarried female with rheumatic heart disease presented with class 3 dyspnea . She had severe mitral stenosis with significant calcification , subvalvular fusion , and a LA appendage clot . She had an aortic valve which showed mild to moderate AR* was and mild Aortic stenosis ( Peak Aoric gradient 30mmhg ).LV diastolic dimension was 40mm and systolic 26 mm .LA was huge 48 X 56 mm EF was 66 % . To my surprise , this patient was being planned for double valve replacement . (MVR and AVR ) . I agreed with MVR since the valve was completely damaged and neither PTMC or mitral valve repair is possible. However , I was taken aback , how can one plan for a AVR for mild aortic valve disease ? I asked the surgeon ? The answer was even more a shocker to me . Since we are opening the chest for MVR it is better to replace Aortic valve as well . Since repeat surgery can be avoided . The surgeon seemed to be very much convinced about this argument . I asked him , is the mortality /morbidity due to DVR is too high to take a risk . The LV dimension is absolutely normal (In fact it is less than normal !) so the AR is definitely not significant . The surgeon was in no mood to leave me . He argued , Since the mitral stenosis is severe , the AR is probably underestimated . ” We have quiet a few experience of AR worsening after MVR” ? he asserted ! I still fail to understand the reasoning of the surgeon . How is that , indication for AVR could vary if it is accompanied by mitral valve disease . If the same patient has isolated moderate AR AVR is forbidden . Poor patient ! By the way , we have problems with our patients as well .I recall an event , a disappointed patient’s spouse arguing with his the doctor for not fulfilling his Initial promise of replacing two valves . We are living in difficult times , I agreed with the surgeon ! Do we have alternate solutions ? Assess on table after MVR by TEE if the AR seems worsen proceed with AVR . Modern technology might answer .Let us dream TAVR for rheumatic valve . . . not too far ? *Transcutananeous Aortic vale replacement . 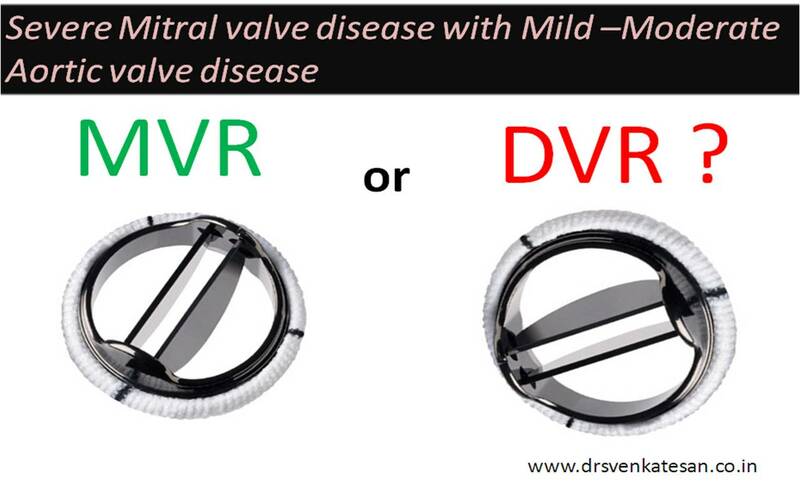 Cardiologists and cardiac surgeons should take extra care before finalizing a decision on DVR in any combined valve disease. It may seem easier to replace two valves . Please spend few moments silently and think about these young men and women . Valve replacements are not like replacing worn tires of your car. Do not burden the heart with multiple artificial valves without a real need for it ! The rate of progression of Aortic valve disease following MVR can be slower than we think . With surgical techniques and expertise improving every year , repeat aortic surgery may be done safely in selected few , in case it becomes necessary !